The Mexican flag proudly and prominently waves over Mexican buildings and squares throughout the country. But do you know what the red, white, and green symbolize? What about the image in the center? Read on to find out why the flag of Mexico looks as it does today and how it developed over time. The Mexican flag consists of three vertical bands in green, white, and red, with the Mexican coat of arms in the center of the white band. The coat of arms portrays a golden eagle perched on a prickly pear cactus and gripping a snake in its beak and talons. The flag's proportion is 4:7; although the flag of Italy has the same colors, its proportions are 2:3, and the Mexican flag is differentiated by the shade of the colors, the symbol in the center, and its aspect ratio. The Mexican flag, along with the Mexican coat of arms ( escudo nacional) and the Mexican national anthem, is considered one of the sí­mbolos patrios, or "patriotic symbols" of Mexico, and thus commands great respect from Mexicans. The current national flag was adopted on September 16, 1968, and was confirmed by law on February 24, 1984. The first flag of Mexico, which was initially adopted by the father of Mexican Independence, Miguel Hidalgo, was a standard with an image of Our Lady of Guadalupe, who is the country's patroness still today. The nation's first president, Guadalupe Victoria (originally named José Miguel Ramón Adaucto Fernández y Félix but changed his name to represent the victory over the Spaniards in gaining Mexican independence), carried this flag into battle and changed his name accordingly after the assault in Oaxaca of 1812. The colors were adopted by the Army of the Three Guarantees during the War of Independence, which aimed to defend Mexican religion, independence, and unity. Mexico's flag as it is today was adopted in 1968, though a very similar flag had been in use since 1821. Originally the green represented independence, white represented religion, and red the union of Americans and Europeans, but during the secularization of the country under President Benito Juarez (who was president of Mexico from 1858 to 1872) the meanings of the colors were adapted to represent hope (green), unity (white), and the blood of the national heroes (red). The Mexican coat of arms is an image that represents the legend which recounts the way in which the Aztecs came to choose the site where they built their capital city of Tenochtitlan (where Mexico City stands today). The Aztecs, also known as the Mexica ("meh-shee-ka"), were a nomadic tribe traveling from the north of the country. Their leader, whose name was Tenoch, was informed in a dream by the god of war, Huitzilopochtli, that they were to settle in the place where they would find an eagle on a prickly pear cactus eating a serpent. The place where they saw this sight was quite inhospitable—a swampy area in the center of three lakes, but this is where they settled and built the great city of Tenochtitlan. 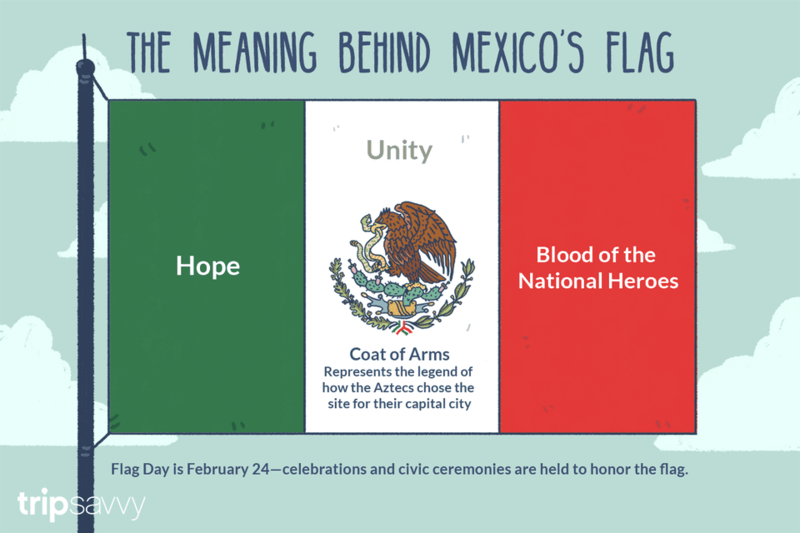 February 24 is Flag Day in Mexico and it is celebrated with civic ceremonies honoring the Mexican Flag.